Omron Electronics has released NT3S, the Human machine Interface (HMI). 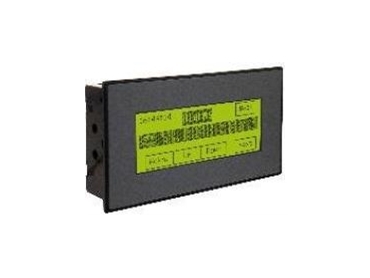 The NT3S is a simple and cost-effective alternative, which compliments the Omron Electronics low-end range of HMIs. Measuring just 132 x 69mm, the NT3S is only 34mm deep, meaning it can be slipped into slim panels. However, it still provides 192 x 64 pixels of graphic information on a monochrome LCD. Also, the entire display area is an analogue resistive touch panel, making the unit interactive and more intuitive. The NT3S still offers the full range of graphic features, including bar graphs, analogue meters, picture library, bitmaps (including image converter) and alarms. Data entries can be scaled and/or have mathematical functions applied. Up to nine different languages are supported per project and these can be switched during runtime. Two communication parts are provided for connection to any one of around 25 different devices, including all the major PLC vendors. Printing and programming are also done through the same ports, which support RS232, RS422, RS485 or CMOS. A real-time-clock is also available on some models. The programming software has been completely rewritten and now offers advanced support for both the NT3S and the smaller two-line display, the NT2S. The NT3S is freely available from the web or Omron Electronics’ newly released eData DVD.